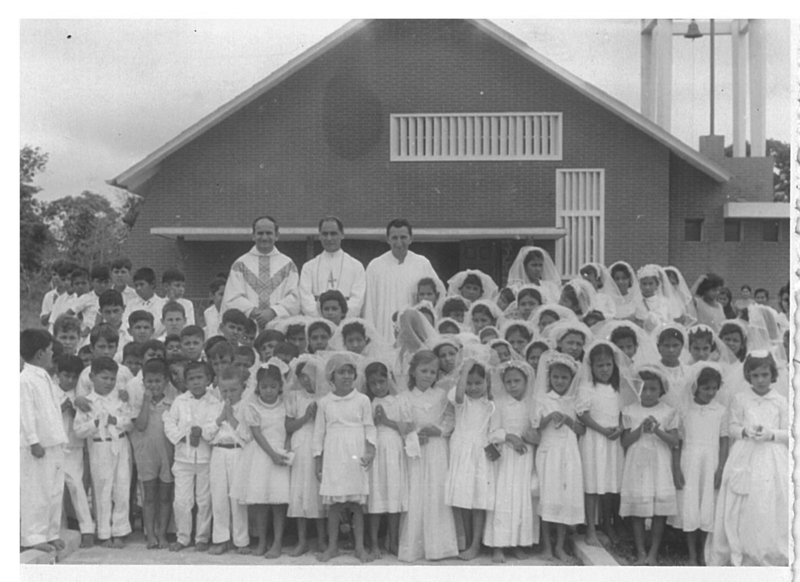 May 3, 1958 was a big event for Father Joe and his parishioners in Bolivia. 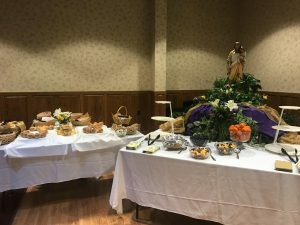 They were planning the dedication Mass for the church in Santa Cruz, built using the $20,000 Lenten donation from the Catholic Students in the Diocese of La Crosse. 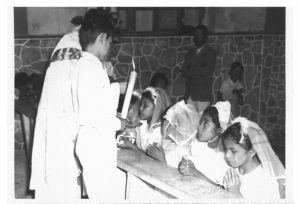 Father Joe was also preparing 50 boys and girls for their first Holy Communion. Members of the La Crosse Council of Catholic Women made and shipped nearly 150 sets of First Communion dresses and suits and other articles of clothing, plus rosaries and medals to be used for this historic occasion. As the investigation of the Cause for Father Joseph Walijewski’s Beatification and Canonization comes to a close in May, the Tribunal will be presenting their report of the life and times of Father Joe. This report, called the Acta, will be taken to Rome to be part of the case. Monsignor Michael Gorman, the Episcopal Delegate for the Tribunal, says that he and the fellow members have a responsibility to investigate Fr. Joe’s life for the purpose of providing information to the Congregation for the Causes of Saints in Rome, with the hopes that eventually they and the Holy Father will find him worthy to be declared venerable. The Tribunal was appointed by Bishop Callahan on May 1, 2013. During that Mass, the members took their oaths. The Tribunal is composed of an Episcopal Delegate, Monsignor Gorman, who is in charge of seeing that the investigation is completed. The Promoter of Justice, Monsignor Joseph Hirsch, is the one who presides over the deposition of the people who have been called as witnesses. Several notaries are included to verify the authenticity of the documentation and numerous typists are involved in the transcription of the witness stories, in the language the testimony was given. Monsignor Hirsch says he is honored to be a part of sharing Father Joe’s story and to hear accounts from all the witnesses, which include many stories he’s never heard before. The witnesses are people who knew Father Joe, including family members or friends he had growing up in Michigan and people that worked and interacted with him in La Crosse and in South America. As part of the Tribunal, two commissions were formed, broken into historical and theological focuses. The Historical Commission is responsible for composing a report on the life and times of Father Joe and the Theological Commission looks at his writings and homilies, assessing them to make sure they don’t contradict Catholic doctrine. All the testimonies have now been gathered, so the next step is to send the Acta, assembled by the commissions and the Tribunal, to the postulator of the cause, Dr. Andrea Ambrosi. It is his responsibility to take all the information and create what’s called a Positio. This book will advocate to the Congregation why Father Joe should be declared venerable. Now that the investigation is almost over, Monsignor Gorman reflects on all he’s learned about Father Joe over the last five years. While he was acquainted with Fr. Joe in the 1980s, it was through this process that he learned about the many remarkable things he accomplished through his faith in God. “I learned a lot about the hardships he experienced, of basically hacking a parish out the jungle of Bolivia and everything going awry. It’s amazing that he was able to accomplish so much with so little material resources, but out of poverty people came together and shared things and things happened,” he says. 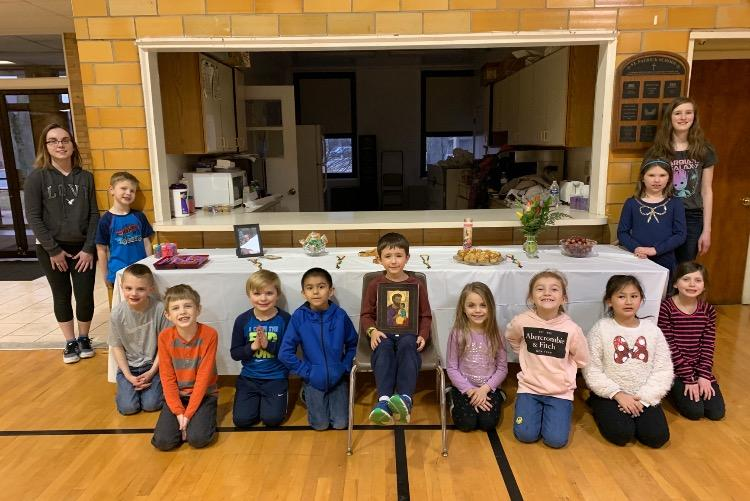 Kathleen Caruso and her 6th grade class at St. Thomas Aquinas Parish School in Lansing, MI, keep the legacy of Father Joe alive every year by watching “A Pencil in Our Lords Hand” and using rosaries from Casa Hogar. Then, after watching the documentary about Father Joe’s life, her 6th graders write letters to their pastor, Father Mark Inglot, Father Joe’s nephew, about what they learned and how they feel about his life and work. Father Joseph Walijewski found his inspiration after seeing how so many of Lima’s children lived, and still live, in desperate poverty. One day, while walking through the slums of Lima, he noticed what appeared to be a pile of old newspapers begin to move. Then, the heads of a little girl and boy popped out. These children, like so many street kids of Lima, had spent the night with only the newspapers to protect them from the cold. He thought to himself, “How can I go home to a warm bed, when so many children are living in these conditions?” It was Pope John Paul II’s donation that started the orphanage, which now bears his name. 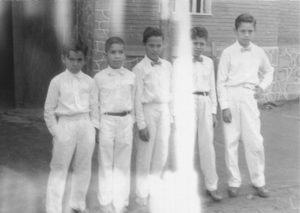 In the beginning, the orphanage was two children, a foreign volunteer, and one tutor. One year later the orphanage was home to 32 children and six tutors. Now, thirty years later, the mission of Father Joe continues to provide a place to call home for 64 children between the ages of 4 to 17 and 24 family teachers. This anniversary year was very special and brought together so many who knew Father Joe. Casa Hogar held its 30th Anniversary celebration in April 2016. Hundreds of kids who lived at Casa, many friends of Father Joe, and members of the community came to celebrate the mission of Padre José. 2016 also saw many changes to Casa Hogar. These changes included improvements such as repainting the house, as well as many structural upgrades. All of these changes are an effort to continuously advance the house and provide a safe living environment for the children for the next 30 years and beyond. However, there is still work to be done and always room to grow to better serve the children. As you can imagine, after 30 years, infrastructure upgrades such as electrical rewiring, new water lines, and a new septic system are needing to be addressed soon. 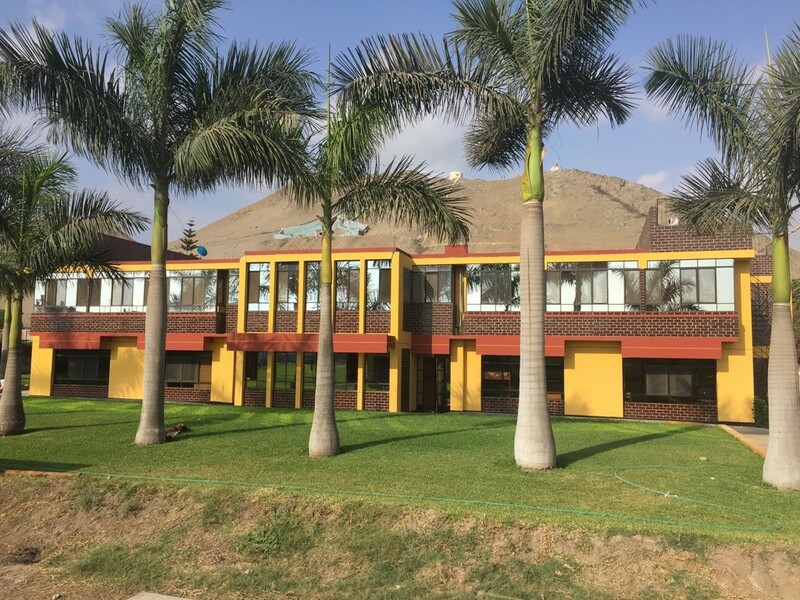 Security needs for the children of Casa Hogar include repairing the perimeter walls, updating cameras, and adding security lights. As Casa Hogar takes the next steps forward and in the spirit of Father Walijewski, we are expanding the work outside of our institution and taking our mission and the generous support of benefactors and visitors and turning it outward. Three years ago, we formed an association of orphanages along with other institutions such as rehab centers, nursing homes, and soup kitchens in our local Diocese of Lurin. Dozens of institutions are reaching thousands of people in need, with Casa Hogar as the driving force. The association is designed to share ideas and resources while providing support in tougher times. 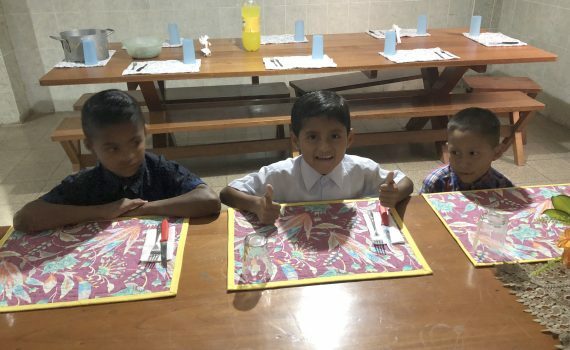 This is just one of the many examples of how, after 30 years, the mission spirit inspired by Father Walijewski continues to grow and bear fruit for the people of Peru. Thank you for your help over the years. We will continue to dedicate ourselves to bringing hope to the children placed in our care.